I was at the BYU Spring football scrimmage and saw also sitting alone an acquaintance, Dr. Wilford LeCheminant. We got together and didn't watch too much of the game. He knew of my plans to do something in Guatemala. I knew he had spent some volunteer time on the Hospital Ship Hope. I described my plans. He told me of his association with a group of physicians and dentists interested in getting a project going in Guatemala. They were calling their organization, AYUDA, Inc. He became one of the 3 or 4 that received carbon copies of my letters describing our efforts beginning the next year in Guatemala. Those involved in AYUDA were Dr. Melvin Lyman, and Dr. Robert Preston, and others. They had received encouragement in what they were calling a "medical mission," from Apostle Spencer W. Kimball of the LDS Church. In 1968 we were visited at the Valparaiso Plantation by Jim Penrod and his wife, Aurora, who was a cousin to Maria, my wife. They wanted to do something, and hinted at joining us, but we were in such a struggle to establish ourselves and survive, that I suggested it might be best for them to contact Dr. Lyman and the AYUDA group. In 1968 AYUDA was legally incorporated, and in early April 1969 Jim Penrod and family, along with Dr. Lyman and others established their project in Cunen, Department of El Quiche, at the home of Rafael Castillo. Rafael was native of Cunen, but a graduate from BYU in Civil Engineering. He returned to his country and soon was very active in the political leadership. By 1980 he was Secretary of State (Ministro de Relaciones Exteriores). Cunen is a small town 6,600 feet in elevation, one of my towns on the traveling movie circuit--Cine Chapinlandia from late 1967 to early 1968. You see Cunen below surrounded by towering mountains. 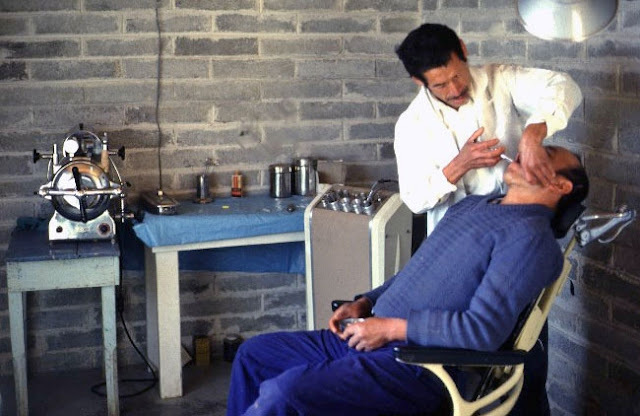 Above is seen the simple dental clinic established by AYUDA with the Cunen native, Diego, trained by Doctors Lyman, and Harris Done. Diego for a couple of years was sent to the Valpariaiso Center for Indian Development so we could help him overcome an addiction. Below you see him working, tongue in cheek, at Valparaiso. 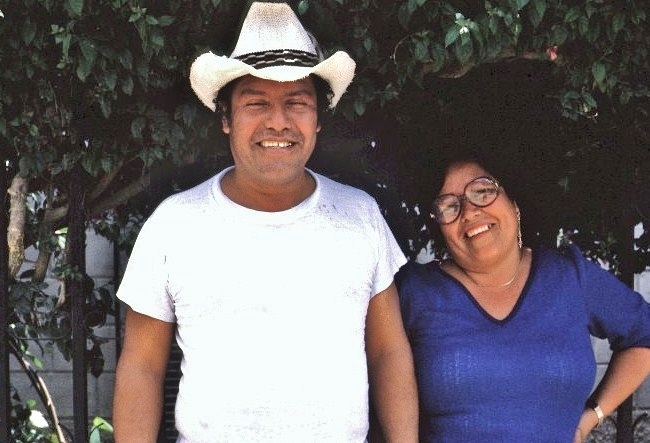 For a summary of AYUDA'S story, see OUT OF OBSCURITY INTO LIGHT, by Dr. Melvin Lyman. 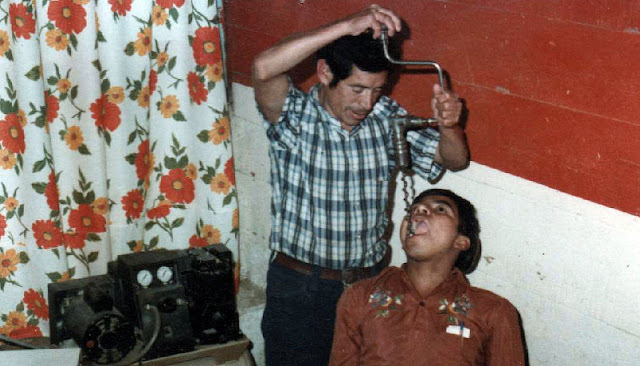 For our purpose here we'll jump ahead to 1981 when the Guerrilla War had heated up all over Guatemala. The Valparaiso Center had to be suspended and I brought my family back to Provo, Utah, but persisted with the business and some projects in Guatemala, making 5-6 trips each year, spending 2 months in Guatemala, and two in the U.S.
My center of operations was in Guatemala City, making unannounced, sporadic visits to Valparaiso, with some projects in the area supervised by Federico Veliz. I got other projects going in the Patzicia area, an hour from the City up in the Central Highlands. 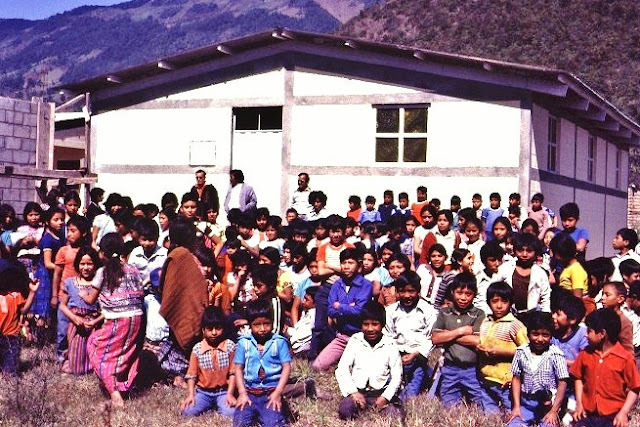 AYUDA had organized a Credit Cooperative among the LDS Indigenous members in Patzicia through their volunteer, Dan Noorlander. They also had functioning 10 small neighborhood schools in Cunen, and the dental Clinic. 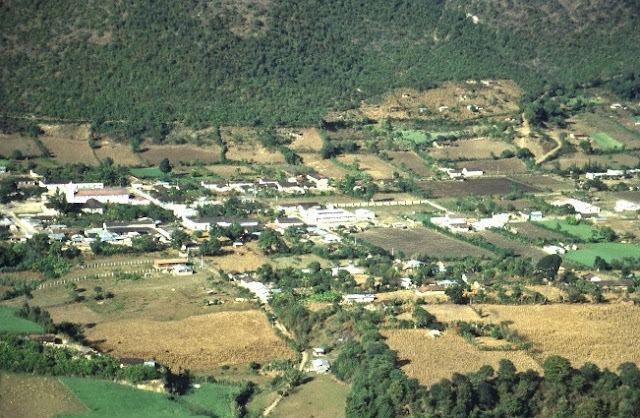 The problem was that nobody from AYUDA wanted to risk traveling to Guatemala, and their projects were in shambles, and the person that was supposed to get funds to the projects was failing. On learning that I was spending half my time in Guatemala, they invited me to be their Field Director. I went to work organizing their Credit Cooperative in Patzicia, and began giving them again the classes I was giving before the 1976 earthquake in the Philosophy and Principles of the Good Life. You see below the members of the Coop. 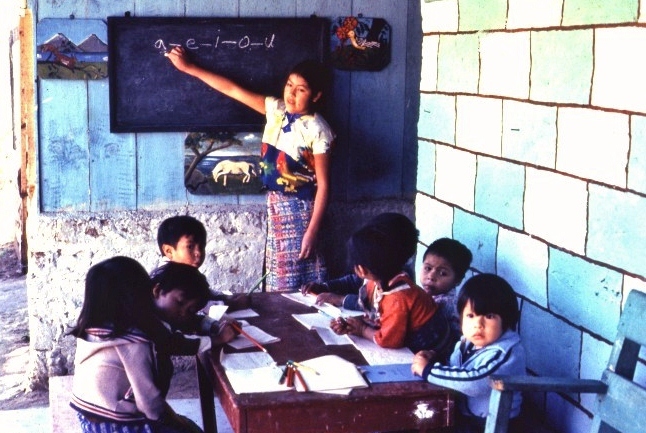 In the Good Life classes education was a major topic and I learned that many of their children were not going to school. Their reasons were not having enough money to acquire the necessary school supplies. 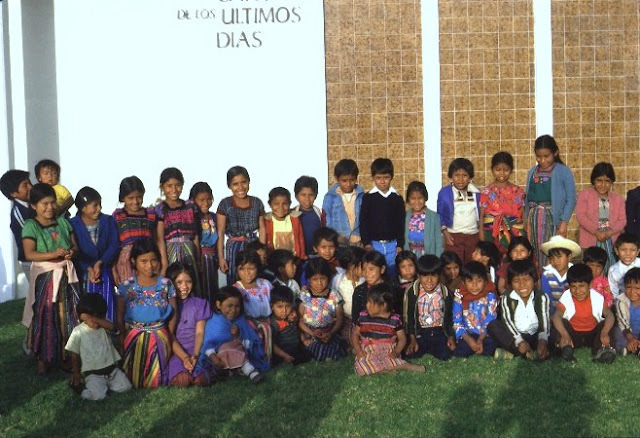 With financial help from AYUDA we began providing $10/month per child, the initial group being 30, but soon it grew as you see below, and so the Foundation began making up the difference. I also began making trips to Cunen up through and into what were called "conflict zones" with high danger from guerrillas. 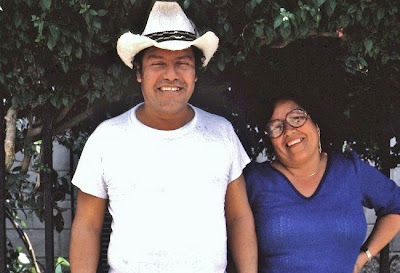 Our representatives were a brother sister team: Professor Jaime Gamarro and his sister, Esperanza. You see them below. We worked out a system, through a son in Guatemala City, to get them the money they needed to get the 10 little schools going again. The other project that had got bogged down, due to the money disappearing, was the construction of a Municipal Library. We finally got that finished as you see below, with the students from the nearby elementary school in attendance. Soon the educational project in Patzicia had some problems. For quite mysterious reasons we never understood, some people in AYUDA objected to me teaching the Good Life lessons. At the same time some fraud was discovered with the Cooperative member responsible for distributing the money to the children. The solution appeared quickly when a member of the Cooperative invited me to visit a private school where he was President of the Parent's Committee. They were having problems with funding. It was called The John Paul II School. See this interesting history in the PATZICIA SCHOOL Success Story. 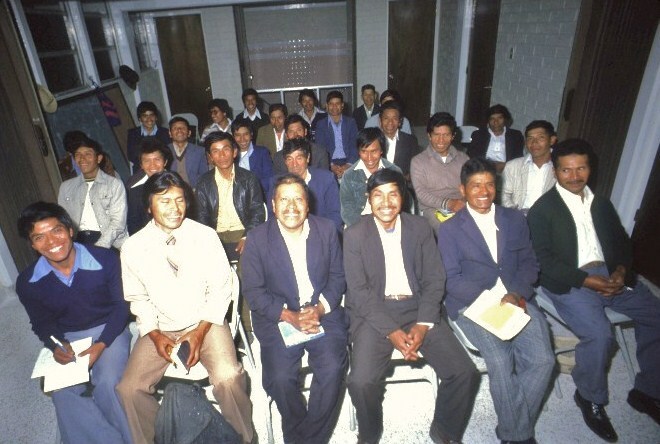 Soon afterwards the AYUDA organization seemed to disappear. 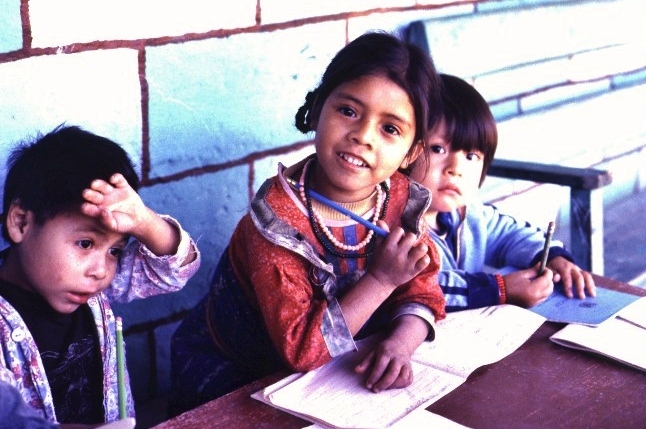 The Guatemalan Foundation continued alone to keep the projects going in Cunen--especially the small neighborhood schools. A few photographs of these schools appear below. 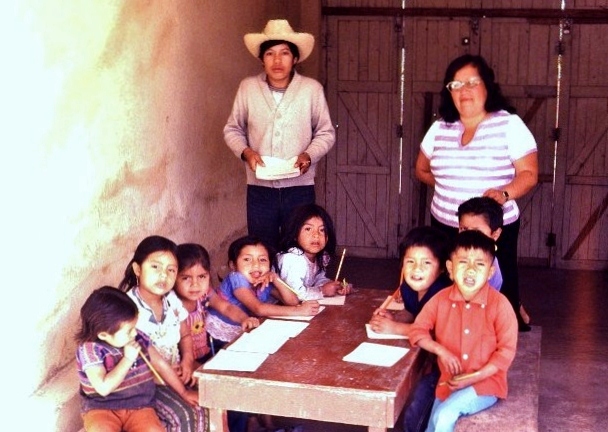 Esperanza is seen here with one of her junior high school teachers and his little class. The young junior high school student/teachers were compensated for teaching the classes by receiving what we called a "scholarship" to pay their expenses for studying in the afternoons at the Cunen Junior High School, established by Jim Penrod. Today it is a government run school. We carried on for ten years with these 10 little schools that were originally established in about 1970 by Aurora Penrod. During those years we also provided our representatives with a color TV, VCR and a set of Good Life videos produced by the Foundation for use in the Library and the little schools. Eventually Jaime's health made continuing difficult while at the same time the Foundation was in a financial squeeze. Nonetheless, a bit more than 20 years of crucial medical and educational aid was provided giving Cunen a huge boost towards greater progress and acquisition of the Good Life.